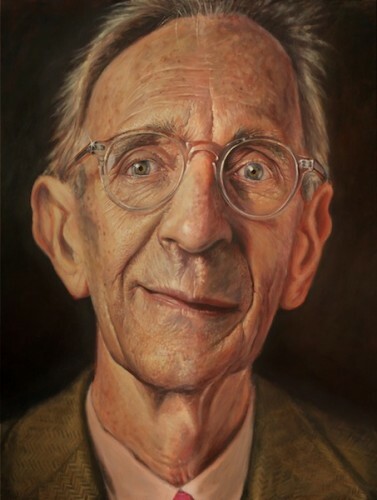 From the 24th February until the 12th March, your infrequent blogger has an exhibition of his more recent portraits at the Hossack Gallery, 28 Charlotte St, London. It’ll be a small show – perhaps six or so large pieces, for sale if you wish and general perusalment. An online gallery of my paintings – mainly the earlier caricatures – is viewable online at derrenbrownart.com, where prints are for sale if you are considering a gift for a least loved relative. For those of you who are talented and attractive enough to follow me upon the Twitter, you may have seen I’ve been tweeting a work-in-progress of my father in real time as it comes together. The plan is to include this and one of my mother, as well as some of the recent ones I have posted on this here blog. Some of you do enquire very kindly about buying originals. I sell the originals through the Hossack Gallery and I’m sure they’d be delighted to take any enquiries. They are big though (the ones above are each five feet high), so you’ve got to REALLY want one in your room. Any enquiries about the art show, please call the gallery on +44 (0) 20 7255 2828. Amazing work. Dame Judi is gorgeous! Love the one of your Dad, too. How many lives do you lead, anyway? What fantastic portraits, i can’t imagine how difficult it would have been to be so accurate on such a huge scale. Brilliant. What medium was used here? I really liked the one of your dad, It was amazing lol. I can’t paint to save myself. But that’s ok coz i can trace stuff Haha. But these two are equally as awesome. Brilliant, I look forward to seeing them. Wowza! These are absolutely gorgeous, fantastic, beautiful, incredible, extraordinary, supercalifragilisticexpialidocious! Aww wow I’d love to go and see your portraits on display, especially as the 5th March is my birthday. Not sure it’s possible for me though. Shall have to imagine just how wonderful they are close up instead. The tweets you posted of the in-progress portrait of your Dad were really fascinating. Am so impressed with the way you build up the portrait. Colours, tones, etc. Is fantastic to see it all come together. I really could have done with a teacher like you when I took GCSE art at school. I didn’t learn a single thing there, not one. You are a quite superb artist, Derren. Don’t let anyone tell you any different. I’m sure you couldn’t have prouder parents. Ere Derren, any chance you know any mind tricks that’ll get me painting masterpieces like yours? They’re phenomenal!! Unbelieveable , great man with great talent! Visiting London that weekend and would so love to see these pictures in the ‘flesh’ They look stunning! Will most definitely do my best to get along to the gallery. Keep up the marvellous work. How captivating are you… magic is not really a thing I understand but this so beautiful. I wish I could paint. out of curiosity, when was that b&w Orson Welles portrait featured on the art site painted? I’m extremely impressed but so unfair that 1 man can be so talented…. Derren, I am doing my best to help make your name known in America, at least among my high minded friends. I have your non portrait books, many of your DVDs and am fast becoming intrigued by you artwork as well. Very nice work! erm, guess i should have looked a lil closer and answered my own q, appears to indicate 2002 by the signature. oops. Woohoo! I follow on Twitter and therefore am considered talented and attractive! In your face Mum! Love your art. Hate that you cant bottle the talent and sell it. bah… london is like one whole country away! ever thought about takin them 2 edinburgh? that’s close enough for me, ill travel anywhere… well, in scotland… to see u! or ur paintings! preferably u! probably wont see u so ill settle for the paintings! well, not really! I always loved ur shows, but really didnt know much about you. I have left a comment about my strange dream last nite, but just to say I didnt know u were an artist. I was totally amazed at how gr8 your work is. Gr8 doesnt cut it really its just brilliant, unique, a characature yet a portrait, never seen anything like it , you have yet another fan. 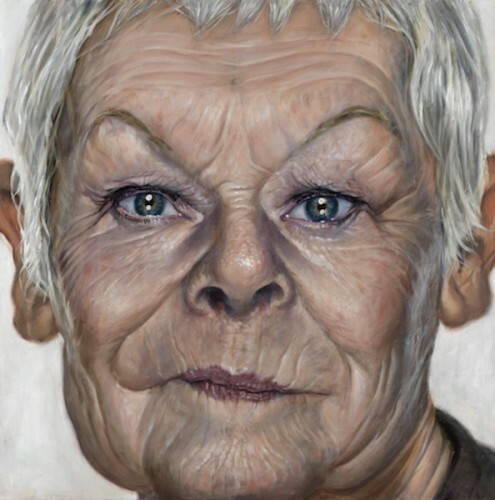 Your Judy Dench is well, so Judy Dench, but doesn’t exaggerate her good points its real yet has a cartoon like quality. Have u considered or have you done a Helen Mirren, that would just be amazing as well as they both although totally unalike have the sort of faces that show a lifetime of hardwork and incedibleness. I could look at ur art always and would love them all round my flat!!! Are you going to be there at all on exhibition dates, and how much are tickets to go? WOW Wooooooow! IÂ´d love too see how your parents look like in your eyes. IÂ´m going to London (from Stockholm) next weekend. Is the gallery open? Can’t wait. And, Sasha; ” … supercalifragilisticexpialidocious” is a great word!! I presume further details will appear on the Rebbecca Hossack Gallery website. I wish I could go to the art gallery but it’s some distance I’m unable to go. Edward John Poynter, Albert Moore and Leonardo da Vinci. Please contact the gallery for details on originals. Hello! I have never seen anything you have done before but whilst researching into a question for my AS level psychology homework your site came up, your artwork strikes me, it’s very unique and you’ve captured the dimensionality of the subject to precision! Beautifully drawn and painted, both works of art. I am doing AS level art too, and both you’re incomparable talents really interest me. You are incredibly talented and Iâ€™ll try my best to read you’re books and take a visit to your exhibition! I’ll be there. Derren, you’re an incredible artist but then you knew that already. Can’t wait to see these brilliant paintings ‘in the flesh’. Love the details in your paintings and wonderful character. …Ha, I just realised you’re THAT Derren Brown. Too much talent for one person! Great painting Derren, I was thumbing through a copy of your book at the weekend and they are very impressive!